"Aulactinia Verrucosa" , Also known as the Wartlet Anemone. 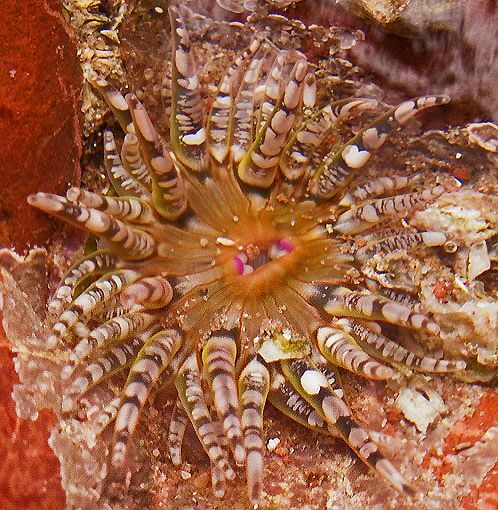 The tentacles are typically striped or banded. When disturbed they contract into very tight, small warty blobs . Base up to 25 mm in diameter and broader than column. Column narrow and cylindrical (grey or pink) , up to 50 mm tall, and covered with small wart-like protuberances (verrucae) - rows of white warts and rows of smaller greyish warts. Middle to lower shore under boulders ,in crevices, rock pools .